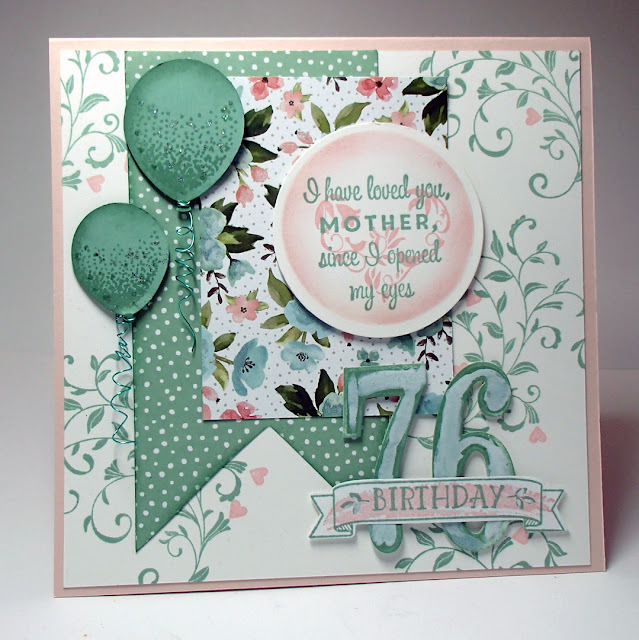 Break out your Favourite Birthday Stamps and create and share your prettiest Birthday Card! My card was quick and simple! Good for me because I don't have a lot of extra time on my hands with Dad being ill. 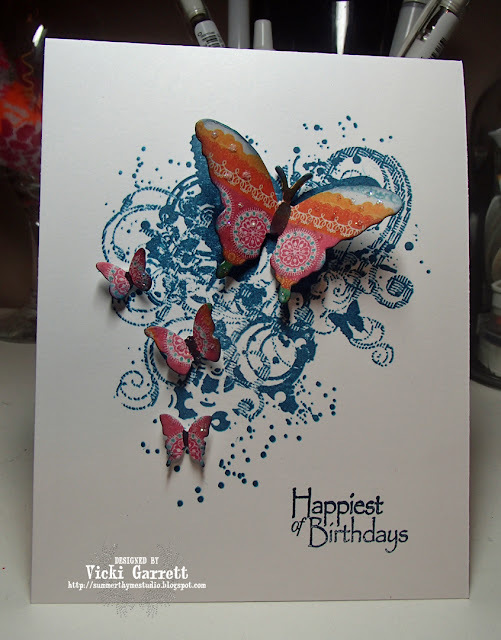 I used this awesome Grunge Butterfly stamp. To soup it up a bit, I mounted butterflies from the Butterfly set (the small ones) and Butterflies Die set. I cut the butterflies out of some summery Prima Designer Paper that I had and then added a splash of glitter, 'cause well no card is complete without glitter!! To finish it up, I added the Happiest of Birthdays sentiment from the Mini Inspirations 3 clear set. It's currently out of stock, but I'm sure it will be available soon. Here's to many more you l'il Devil! Hope you're week has been going well. 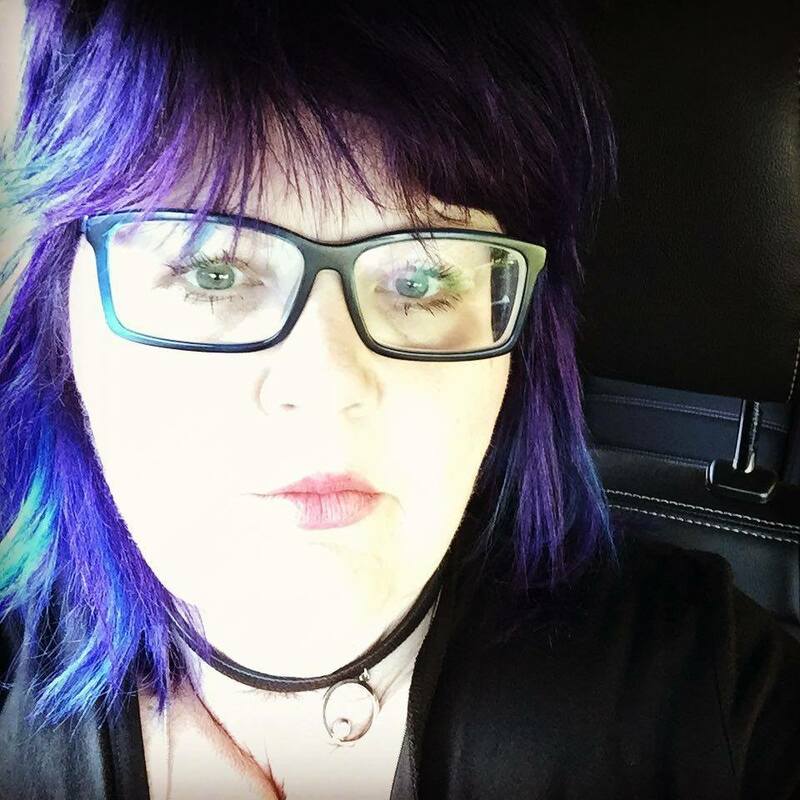 Yesterday was a long day and since i'm blogging this the night before you read it, I'm going to keep it short and sweet!!! The challenge today is Friends forever! It never ceases to amaze me. As I mentioned before, creating cards is my solace;brings me peace of mind and is but a brief escape from all that is going on around me. I know that I will be creating a lot of friendship cards in the next little while, because I have some very worthy recipients. As you can see, the card is very clean and simple. 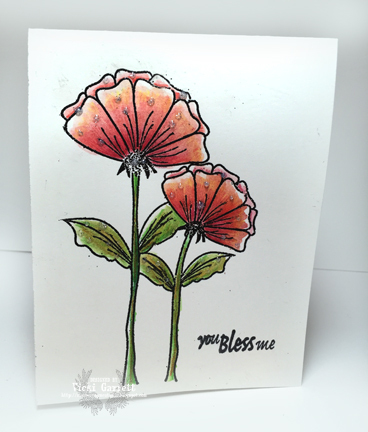 I Stamped the Poppies alone stamp onto heavy weight white cardstock in Versamark and embossed. Then I dug out my old Stampin Up Watercolour pencils and coloured the image very loosely. I added the sentiment from mini inspirations 3 and Voila! The card was finished!!!! 'Kay, so I want to see your creations this week......Please play along! You have a very good chance of winning a gift certificate. Our weekend was good. Dad had many Visitors, which is keeping his spirits up. On Friday evening a couple of my good friends came to the house and we had a little "Jam" for him. He loves Bluegrass Music. My friend Sean is an amazing fiddle player, so along with Randy, Cody and myself, we managed to keep the music flowing for a couple of hours. Given that Dad had his first radiation treatment to his Kidney on Friday, he was a little bit tired; but he said he truly enjoyed his surprise. I have a couple of other friends who play bluegrass and old Country Music. Next time, we'll surprise him with a Banjo player! Dad will have four more radiation treatments this week. They have told him to expect more side effects this time because the Kidney is so close to the stomach. I hope that he tolerates it well and that it doesn't make him weaker. His Visitors definitely keep his spirits up! First I made a washed background with Dylusions paint, adding some extra splashes of colour wet on wet. 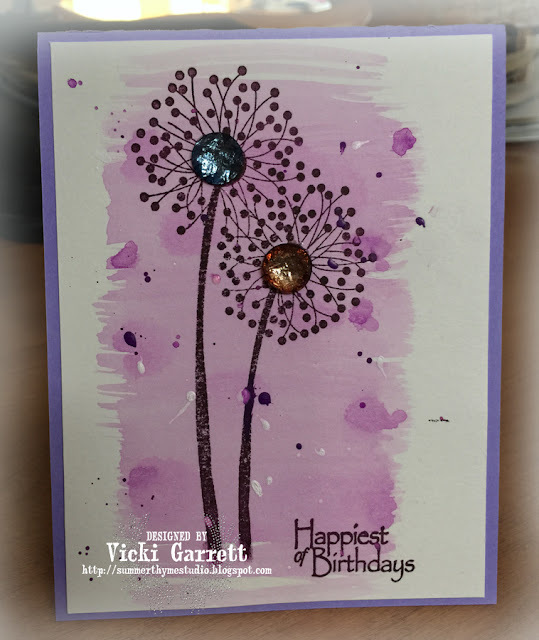 Once the background was dry, I stamped the Dandelion stamp and the Happiest of Birthdays from Mini Inspirations 3 in Blackberry Bliss. I then went in with purple and white paint and flicked more colour on for added texture. I did have purple gems to add the the middles of the dandelions, but I actually preferred the brown and blue centers.